With negativity permeating social media sites and legitimate news sources lately it’s almost as though an information Grinch is stealing away our happiness before we even realize it is in danger of going missing. FORT KENT, Maine — With negativity permeating social media sites and legitimate news sources lately it’s almost as though an information Grinch is stealing away our happiness before we even realize it is in danger of going missing. The good news is, there is still much good news to be found in the St. John Valley. Recently, Mike Voisine, manager of the Lonesome Pine Trails ski resort in Fort Kent shared a breathtaking photo he took from the peak of the Founders Trail overlooking Main Street. This got me to thinking that if the Grinch lived in Fort Kent he would undoubtedly dwell atop the mountain overlooking the Lonesome Pine Trails lodge. There he would have the best view in town and clearly see much good news happening below, even if he was not a subscriber to Fiddlehead Focus or the St. John Valley Times. The Grinch would witness people coming together by the hundreds or even thousands in this land of baked bean and spaghetti dinner fundraisers to support those displaced by fire or those whose children are facing grim medical diagnoses. He would watch community members of all ages volunteer to welcome those from near and far during the Can-Am Crown International sled dog races, all eager to leave a positive impression of Fort Kent on those who visit here. The Grinch also would have a first hand look at the spark of survival instinct among Fort Kent residents who refuse to give up on their dreams and dare to open a bookstore or brewery in town. Surely the Grinch would appreciate the efforts of the PAWS Animal Welfare Society, which has saved the lives of hundreds of homeless and vulnerable cats who were at least as lonely as he is. People not from the St. John Valley recognize how good we have it in terms of community support for one another. This fall I attended the Maine State Class C Soccer Championships in which both the Fort Kent girls and boys Warrior teams were finalists. A ticket taker perked up on that dreary, rainy day when I told her I was a news reporter from Fort Kent. She remarked about the community spirit those from Fort Kent show for their young athletes. “I love when Fort Kent comes down; whenever they do I wonder if there’s anyone left up in the Valley,” she said. If the Grinch in all his thievery were to lift some panoramic goggles during his early Christmas morning tree-raiding he would discover yet more goodness to be found in the St. John Valley towns which lay outside his mountain top view of Fort Kent. He would see that, through the efforts of dedicated educators and parents, Dr. Levesque Elementary School in Frenchville is a National Blue Ribbon School whose students regularly win competitions in robotics. The Grinch also surely would notice the good deeds of the Friends of St. Francis who host free Christmas parties for children, support a local library and help community members who are experiencing tough times. In Wallagrass, he would witness a town whose residents recently grieved the loss of it’s only elementary school yet turned that sadness into triumph when they formed a community center in the school building where children could thrive once again through dance lessons and a daycare. And how could the Grinch not be inspired by learning that U.S. Customs and Border Protection officers honored veterans this year at a local nursing home in Madawaska? A few years before I became a news reporter, I had my own special Christmas experience in the St. John Valley. I was in the process of a divorce and without money to buy presents for my children. One morning that December, I awoke to find boxes on my porch filled with brand new clothing for my children. I never learned who left those welcome gifts, but my own heart grew many sizes that day. 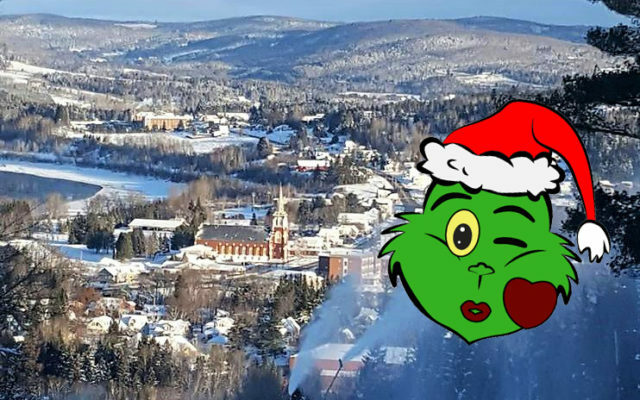 If the Grinch did lurk somewhere among the fir trees above the Founders Trail at Lonesome Pine Trails, I cannot imagine it would take long before he decided to ski, snowboard, snowmobile or slide his way into town, ready to take part in the good news the St. John Valley has to offer.